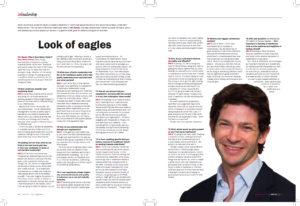 Vision and strong values are key to successful leadership in healthcare says entrepreneur and acclaimed amateur jockey Sam Waley-Cohen. The man behind Portman Healthcare talks to Tim Barsby, Business Development Director at Carter Schwartz, about why developing a culture people can believe in is good for staff, good for patients and good for business. Many things… businessman, entrepreneur, jockey, husband, father, family man. Someone who likes to make the most of life. That’s really my thing – to make the most of it and give it a go. Whether it’s the dental business or racing, it’s putting yourself in positions where you think you can do something well and focusing on that and doing your best. Leadership is about setting values and being firm on those values and allowing people to have enough breadth in terms of how they want to interpret things to do it themselves, so I think I would say I am very collaborative. I think collaborative management is a very powerful way to operate but you need to decide what bits sit within your values and what bits sit within your strategy and hopefully empower other people to interpret that in an effective way. I think the days of real dictatorial leadership in business are very limited and it’s all about bringing good people with you and hopefully making the sum of the parts better than they would otherwise be. Leading on from that, what do you think is the best way to gain buy-in from your employees in terms of collaborative leadership? I think vision and values are fundamental, establishing a culture that people can believe in and buy into, that gives a real purpose to what you are trying to do. So, within our organisation we talk about family values, being open and honest and fair. It’s a healthcare business so our number one thing is to treat people as you wish to be treated yourself. If you can stand in front of your mother or brother or best friend or whoever and say ‘how would I want that person to be treated’, that’s how I treated the last person I say – you’ve probably got it right. Keeping it simple is key. Setting those visions and values and being uncompromising about those who don’t meet them is, I think, the way to set the tone and set the leadership. What does effective leadership look like in the healthcare sector and is high quality leadership more important here over other sectors? I don’t know about other sectors because it’s so generalist but leadership in healthcare is absolutely crucial because you are walking a very important line between altruism and commerce and leadership is how you make sure you walk on that line in the right place. 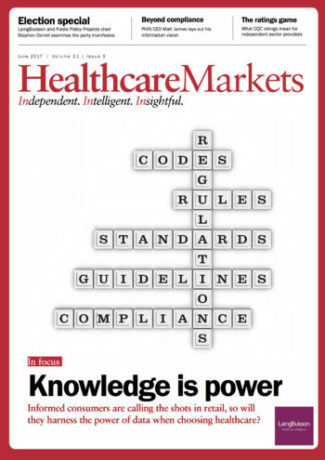 A lot of mistakes that seem to have been made have been about leadership allowing standards to slip or putting commercial imperative before healthcare, so to me good healthcare is all about the product and the product is all about people, so if you look after people, you will have a sound business and looking after people comes from the leadership team. I think particularly healthcare that’s funded through the social budget, through the NHS, there’s also a real onus on delivering a quality service and again that’s about prioritising resource to make sure that you consistently deliver and, again, it’s management and leadership that set that tone and get the priorities right for the organisation. How do you communicate that through your organisation? I think getting it right takes time, so you have to embed it wholeheartedly through your business from the way you recruit to the way you appraise, to the way you reward and to the way that you look after people. I think it’s about being clear about what you accept, what you expect of other people and then positively reinforcing it, celebrating the successes. So, in our businesses, we do it on Facebook and in our internal newsletters, celebrating people who have gone out of their way to do something extraordinary. In your experience, please explain why commercial returns and quality of outcomes are or are not mutually exclusive. Outcome is the only way to have long term sustainable quality commercial returns. It’s fundamental for healthcare to have a long term outlook because any short term alternative comes back to damage your product, which is looking after people. So being prepared to invest for the future is fundamental. If you look after people they either recommend you or they come back and it becomes self-fulfilling, so the commercial imperative is all about looking after people well in the first place and then you have something successful. How do you ensure that your organisation connects with the market in a way that anticipates future needs? Anticipating future needs is mostly about listening to your customers and to what else is going on in the market. Nearly everything that the future needs is already being done somewhere and if it’s not being done somewhere it’s probably too far into the future to be putting it throughout your organisation. It’s about engaging with the people on the ground and listening to your patients. If you actually get the fundamentals right you are already moving forward and seeing into the future because you are always thinking about how to do it better. Is there anything specific that you believe everyone in healthcare should be working towards collectively? I think true consumer choice has been something that has driven people, society forward enormously. In free market economics that’s something that collectively has helped the world evolve enormously and in healthcare there’s a massive distorting monopoly which is the NHS – monopoly is the wrong word! Hegemonic power basically and I think we should work towards a more open discussion around consumer choice, of what you are going to get on the NHS, what you might get if you go privately and equally make sure that the choices aren’t necessarily about financial strains but about what’s right for you as an individual and what your needs are. Trying to open up, not to privatisation, but to pre-market economics in terms of people deciding who they want to see, where they want to see them, when they want to see them is to me quite a sensible straight forward idea. How do you build teams that are innovative and effective? As always, it’s about being very clear on the priorities, being very clear on getting the basics right so that you know whether you are within your comfort zone or outside your comfort zone and it comes back to culture. It’s about having an open and honest culture and saying we’ve got this wrong or we’ve got this right, sharing that knowledge and empowering people to make decisions so that there’s not a hierarchy of ‘I know I would do this but I’m not going to make that decision because if it goes wrong, I’ve got a long drop’. It seems to me that would stop any innovation. You want people to be prepared to back their own judgement, take some decisions, know that as long as they are within a framework of a rational decision being made that’s within the rules, if it goes wrong it’s not the end of the world and they will be supported in that. I think the team nurtures itself. It’s also about having clear objectives. What advice would you give yourself on your first day in healthcare? It’s going to be really hard! Creating a business is hard, creating a business that has a lot of constraints around it, regulatory is even harder, and to commit to it. It’s going to be hard and stick with it. I’ve been doing it since mid-2008 and we launched in 2009 so eight years. Healthcare is a wonderful sector, there’s so much to be done, it is changing so fast and the company has done a lot of the things that are hard to do, which is create a good culture, set clear objectives and get people lined up behind those, so the future is really to capitalise on that and build and grow and to make sure we keep investing in the team and bringing on good people because you need the best people. What’s your biggest commercial mistake? Lots of them! I think most businesses fail or succeed on incrementals. So, it’s either lots of good decisions or lots of bad decisions because it’s normally pretty obvious when there’s a massive great bear trap that’s there and you are going to walk into it. Most of my mistakes are around people – who do you work with, how do you recruit and retain, who do you want to retain, when is the moment for them to be focusing on something different, that’s how an organisation grows and that’s really hard when you are small because it takes a lot of energy and discipline and it’s quite grey so it’s a very hard decision. Wildcard from Tim Ashlin of Synova Capital – How important is branding in healthcare, what are the positives and negatives of having a brand? Branding is really important because reputation is really important and brand is the external perception of presentation of reputation. But I think in healthcare, the branding is as important internally as it is externally, so making sure that the people you want to work with you and the people who do work with you understand what you are about and what you are trying to do is at least as valid a concern as what you are trying to present externally to consumers. Most patients take comfort in a brand but don’t select their healthcare on a brand.